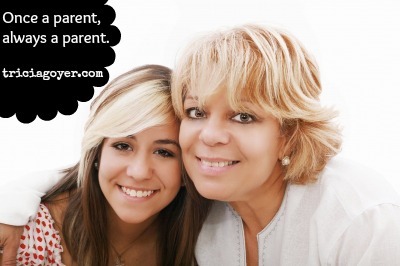 Phil: It is never too early or too late to be a better parent. Put your past victories and defeats in the “up to now” category. Apply grace and forgiveness to yourself and your kids as works-in-progress. Then ask God to guide you through His Holy Spirit to fashion a “from now on” perspective for the future. The older the child you are dealing with, including adult children, the more likely you will be successful if you adopt a “How can I help?” versus “How can I fix it?” frame of mind. As you seek to influence your child’s ability to make good choices, remember to catch yourself doing something right. Praising your progress will allow you to hang in over the long haul. Tricia: As long as you are alive, you will always be a parent. I’ve learned this from my 83-year-old grandmother who is still doling out a lot of advice and prayers to her daughters who are in their 50s and 60s! With every stage—elementary, teen, and adult—there will be new challenges, but the number one thing a child wants to know is that he or she has a parent who loves, believes, and will be there for him or her. Isn’t that what we all want? We may not always have the right answers, but we can lead our children to our God, who has the right answers. We can lead them to hope. We can lead them to faith. And even if they refuse to follow our leadership, you can guarantee they will always be watching to see how we do it, even when they don’t want to admit it.